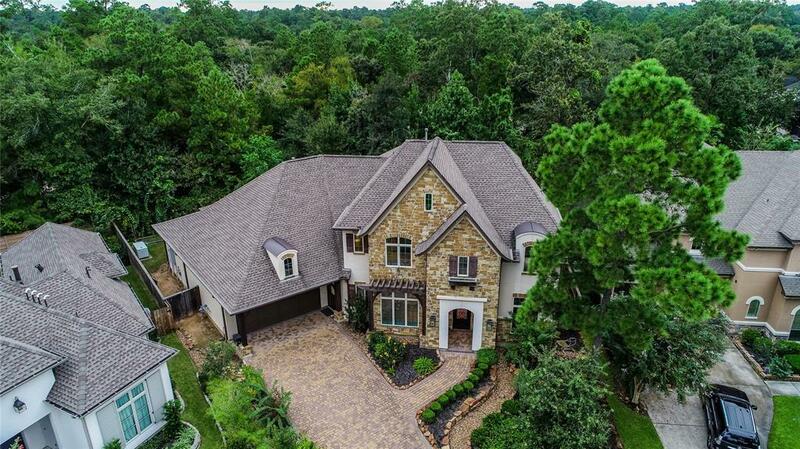 Live in luxury in this incredible Woodlands home, featuring high ceilings, hardwood and tile flooring, plantation shutters, custom trim work, gas fireplace with adjacent built-ins, granite countertops, a home theater, and whole house generator. Energy features include high efficiency HVAC, low-E windows, extra insulation, and Energy Star reflective roofing. The gourmet island kitchen boasts custom cabinets, Wolf gas range and double oven, pot filler, and Sub-Zero refrigerator. Relish in the master suite with a tray ceiling, bay windows, walk-in closet with built-in shelving, his and her vanities, freestanding tub, and shower. The spacious backyard is ideal for entertaining with a covered patio and fully equipped outdoor kitchen. From top-ranked schools, such as The Woodlands Christian Academy, to award-winning restaurants, this home’s proximity to major points of interest, including Waterway Square, Market Street, and the Cynthia Woods Mitchell Pavilion, is unmatched.